John D'Ambrosia, chair of the IEEE 802.3 400Gbps Study Group, spoke on Tuesday at the Ethernet Alliance's Technology Exploration Forum in Santa Clara, California. As it embarks on what's likely to be a long journey to its next big increase in speed, Ethernet is in some ways a victim of its own success. Years ago, birthing a new generation of Ethernet was relatively straightforward: Enterprises wanted faster LANs, vendors figured out ways to achieve that throughput and hashed out a standard, and IT shops bought the speed boost with their next computers and switches. Now it's more complicated, with carriers, Web 2.0 giants, cloud providers and enterprises all looking for different speeds and interfaces, some more urgently than others. Facebook, for example, said in 2010 that it already had a need for Terabit Ethernet in its data centers. That's what the IEEE 802.3 400Gbps Study Group faces as it tries to write the next chapter in Ethernet's history. With billions of Ethernet devices in use on networks around the world, it's harder to define a specification to that satisfies everyone. 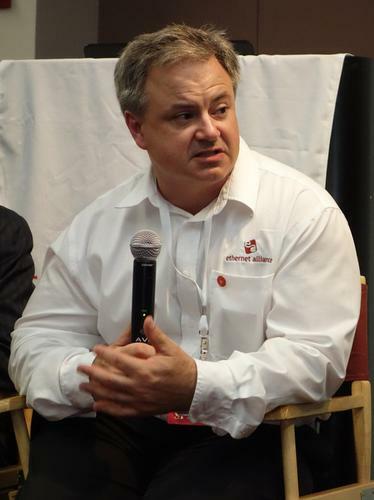 "You have a lot of different people coming in to the study group," said John D'Ambrosia, the group's chair, in an interview at the Ethernet Alliance's Technology Exploration Forum in Santa Clara, California, on Tuesday. That can make it harder to reach consensus, with 75 percent approval required to ratify a standard, he said. Though the panel knows what speed it's ultimately looking for, network builders with different needs are likely to disagree on how to get there. The complexity of the task has only grown since the last standard-setting process, which produced the 802.3ba standard that covers both 40-Gigabit and 100-Gigabit Ethernet, D'Ambrosia and others at the event said. That project started out focused solely on a 100Gbps standard, which service providers wanted, but expanded to include 40Gbps because enterprise servers weren't ready for the higher speed. If the 802.3ba experience is any guide, the next standard -- to be called 802.3bs -- will probably not be ratified until the first half of 2017, D'Ambrosia said. That's an aggressive target, according to Dale Murray, an analyst at research firm Light Counting, who thinks the path to 400-Gigabit will be a lot harder than the last standards process was. One of the key questions is what smaller links to put together to achieve the next top speed. This is a common way of creating fatter pipes. The links can take the form of multiple fibers, optical wavelengths or other connections. This was relatively easy with 802.3ba, the 40/100-Gigabit standard, according to Murray. The engineers that developed that standard used multiple 10-Gigabit Ethernet interfaces, the previous hallmark of Ethernet speed, which were already commercially available, he said. "We didn't create a lot of new technology. It was more of a packaging challenge," Murray said. To achieve 400Gbps, they'll need new, faster interfaces to use as building blocks. There's a range of possible options, all of which have different ramifications, participants in the event said. Variables include how much components cost, what kinds of fibers or cables they use over what distances, and when they may be available. The best way to get to 400-Gigabit Ethernet would be with four 100-Gigabit interfaces, D'Ambrosia and others said. This would help to generate an effect that occurred with the current specification and which D'Ambrosia may propose as an objective in the current process. It turned out that vendors were able to develop 40Gbps interfaces that enterprises could outfit with so-called "breakout cables" to create four 10-Gigabit Ethernet links. That gave buyers a product that met both their immediate and future needs, and it helped to grow the sales volume of 40-Gigabit interfaces, which in turn drove down the cost of the parts, D'Ambrosia said. "It was a useful outcome that occurred naturally," Murray of Light Counting said. Other possibilities include using eight 50Gbps connections or 16 25Gbps connections. Without endorsing any individual approach, Murray cautioned against pushing out a technology that's available sooner but may not match up with current or future needs. If buyers don't see good value in it, they won't buy it in big enough volumes and the industry will have to wait even longer for 400-Gigabit Ethernet to take off, he said.